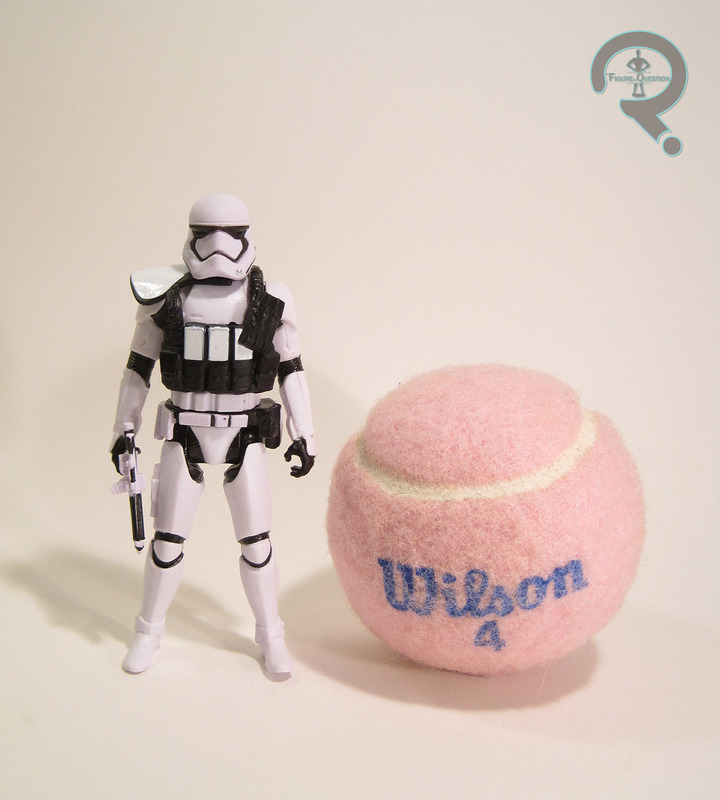 It’s been almost a week since the last time I looked at a Star Wars toy. And I amassed quite a number of them towards the backend of last year, so there’s just sort of this pile of them waiting to be reviewed. Here’s one off the pile. The First Order Stormtrooper Squad Leader was part of the early 2016 Snow Gear assortment, alongside unmasked Kylo Ren and Nien Nunb). The figure stands a little under 4 inches tall and has 5 points of articulation. In terms of construction, the Squad Leader uses the same basic tooling as the standard FO Trooper (and by extension, all of it’s deviations, reviewed in the First Order Legion set), which is sensible. As I noted when I reviewed it before, it’s a pretty strong sculpt, and accurately recreates the First Order armor from the movie. The main appeal of this figure is the web-gear, which is unique to this guy. It’s a combination of the Heavy Artillery Trooper’s ammo vest with an Officer’s pauldron. It’s different enough to keep him interesting, which I guess is the point. Paintwork for this figure is pretty much on par with the other FO Troopers I’ve looked at. There are some fuzzy lines here and there, but by and large he’s pretty good. 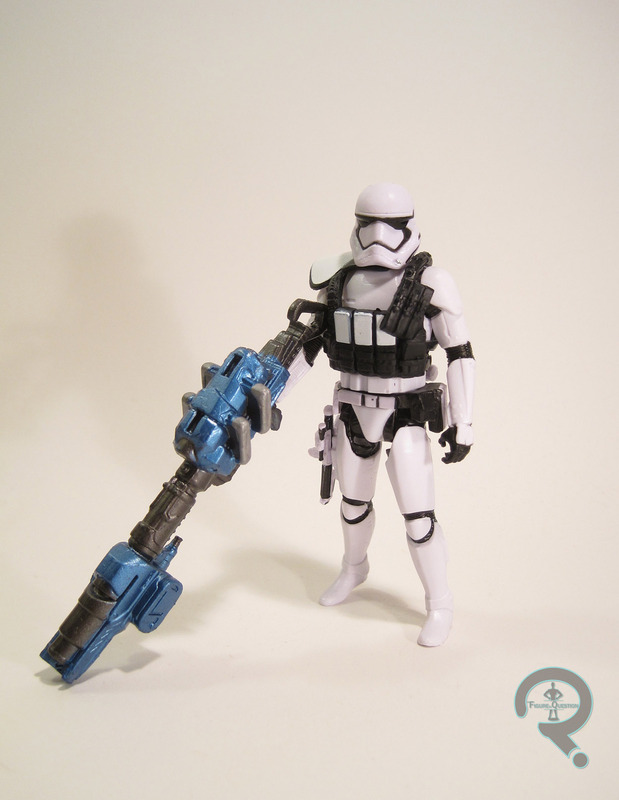 The Squad Leader includes a basic blaster rifle, as well as a much larger blaster that’s part of the build-a-whatsit. It’s kind of a cool piece, though it’s actually taller than he his, so getting him to hold it is kind of tricky. Still, better than a lot of the pieces included with these figures. Being part of one of the later assortments of the Force Awakens line, this guy never really showed up at retail in full force. I ended up getting this guy from Cosmic Comix during their Biggest Sale of the Year! (TM). I like the Heavy Trooper look, and I liked this variation of it, so I got him. Is he really different from figures I already own? Not really, but he’s still pretty fun. I really hope this guy shows up in the Black Series at some point. He’s pretty much the only First Order trooper from the film they didn’t make in the larger scale. Yeah, I’d really love him at that scale. He wouldn’t even need much new tooling, just the vest piece. I’m a little suprised we saw the Flametrooper and Snowtrooper before this one. I’d probably have bought the Disney diecast Heavy Trooper by now if he weren’t part of that large set.